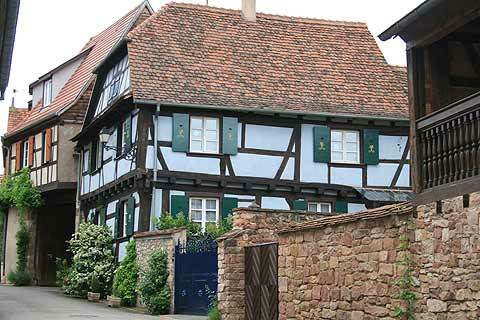 Rosheim is a town to the north of Obernai in the Haut-Rhin department of the Alsace region. Although slightly off the main tourist route a visit is recommended, above all for the attractive roman style church. It is easy to explore the lovely little town of Rosheim - you enter Rosheim through one impressive medieval gateway (then further down the street you leave by another). Yu can get a guide from Rosheim tourist office in before you start exploring to be sure you see all the individual highlights. Inside this main section of the historical town you will see Rosheim's roman style Church of Saint Peter and Saint Paul, part of a monastery still inhabited by benedictine monks. The church dates from the 12th century, although the unusual octagonal bell tower was added in the 15th century after the original had been destroyed by fire. 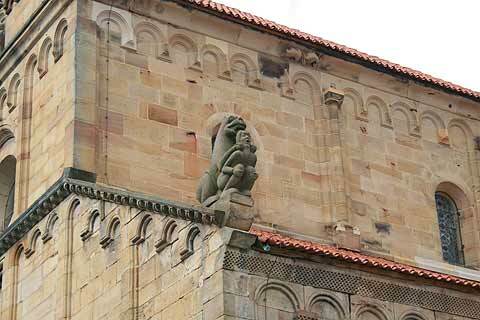 There are some interesting stone carvings of the evangelists and other carvings decorating the outside of the church. Also outside the church look up at its roof which has some strange statues huddled upon it - the church is one of the oldest in Alsace to feature actual statues rather than stone carvings. 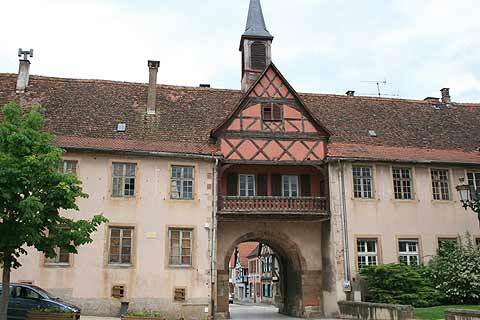 In Rosheim there is building between 21 and 23 Rue du General du Gaulle that was built in 1152, which is possibly the oldest building in Alsace. The bakery also had a sign on it saying it is the oldest bakery in Alsace - at 400 years old - not bad! The town has quite a sprinkling of interesting medieval buildings - for example the 16th century houses between Rue du General de Gaulle and Rue des Violettes, with their interesting original carvings in wood. You can also see the four original entry gates through the fortifications - the Porte de l'Horloge (next to the 18th century Town Hall) and the Porte de la Vierge are particularly impressive. One particular attraction we recommend is the monastery at Mont-Sainte-Odile, in a very picturesque countryside setting to the south of Rosheim. 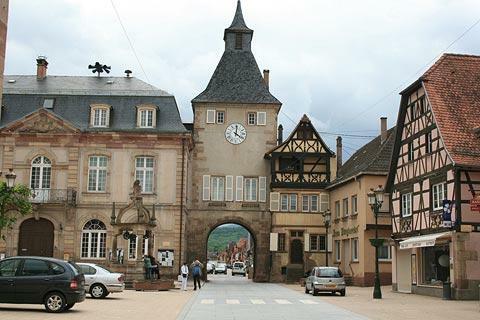 Rosheim is also on the Alsace Wine Route with many pretty villages and vineyards to explore including Mittelbergheim, ten kilometres south of Rosheim and a classified 'most beautiful village in France'.